In the north-western states (Washington, Oregon), the weather is cool and rainy along the west coast and along the west-facing slopes, in cities like Seattle, Portland, Eugene. Average winter temperatures are about 3/5 °C (37/41 °F), but every so often cold air masses coming from Alaska can arrive here. Here are the average temperatures in Seattle. Rainfall is most abundant from November to January, and in any case, it's common for most of the year, except in summer. In fact, in July and August, the weather is pleasant and quite sunny, with cool nights and some morning fogs. In Seattle, there are about 2,000 hours of sunshine per year. While rain is frequent, snow is rare: on average, 15 centimeters (6 inches) of snow fall per year. Here is the average precipitation. Near Seattle, the sea is cold all year round, as can be seen in the following table. Proceeding south, the west coast remains cool even in northern California, and down to San Francisco, but winter becomes progressively milder, and even cold spells become more rare. In San Francisco and in the cities located in the bay of the same name, the climate is mild, rainy in the winter months, and sunny in the remainder of the year. Summer is particularly cool, often foggy in the morning, and the temperatures are similar to those of London. But luckily, in late morning the sun comes out, and it usually shines for the rest of the day. Sometimes, however, even in San Francisco it can get hot, when the wind blows from inland. Near San Francisco the sea is cold all year round, and the water temperature varies little between winter and summer. Continuing south along the coast of California, the temperature continues to rise, and the climate becomes milder, very pleasant, spring-like and sunny all year round, down to the border with Mexico. This happens because along the coast of California a cool current flows, which is able to make the climate mild and to hinder cloud formation, although it can generate some coastal fogs. But away from the coast, in summer the heat is more intense. For example, in the Sacramento Valley the summer temperatures are considerably higher than on the coast: in July and August, highs in cities like Redding, Stockton, Fresno, Bakersfield are around 32/34 °C (93/97 °F), while on the coast they do not go above 20 °C (68 °F)! Going further south, in the Los Angeles area, the climate is pleasantly warm for most of the year: this is perhaps one of the finest climates in the world, even though it only applies to the coast and the surrounding areas. In July, the average maximum temperature is 24 °C (75 °F) in Santa Barbara (on the coast to the west of Los Angeles) and it's already 28 °C (82 °F) in downtown Los Angeles, while 40 kilometers (25 miles) to the east, in Pomona, still in the Los Angeles conurbation, which is very extended, it's 33 °C (91 °F). In San Bernardino, 45 kilometers (30 miles) more to the east, the average reaches 36 °C (97 °F), while in Palm Springs, 70 km (45 miles) to the south-east, and located in the desert, it is as high as 42 °C (108 °F). Here are the average temperatures of downtown Los Angeles. On the coast near Los Angeles, the sea is very cool even in summer, however, it reaches 18 °C (64 °F) in September. In Los Angeles, the sun shines throughout the year, except during the short periods of bad weather which can occur in winter: movies and television drama series filmed in Hollywood, where the sun always shines, do not lie. It rains (not much) from mid-November to mid-April, and almost never in the rest of the year. In winter, the maximum temperatures are very mild, around 18/20 °C (64/68 °F). The only disturbing element in the climate of this region is represented by the Santa Ana, a hot and very dry wind, which can affect the coastal regions of Southern California. This wind is often accompanied by dust, and it's also capable of generating fires. More frequent in autumn and winter, it can occur in all seasons, and usually lasts a few days. The islands off the coas of California (Channel Island, Santa Catalina, San Clemente, etc.) are very mild, sunny and semi-desert. In winter, they are as mild as the smaller islands of the Mediterranean, while in summer they are cool, with highs around 20 °C (68 °F). In addition, owing to the cool current, cloud banks can form above the sea in summer, so the sky can be overcast. In the United States there are four desert areas, contiguous to each other. The northernmost is the Great Basin, an area that covers most of Nevada and western Utah, but having cold winters it will be discussed later, along with the highlands. Here, on the contrary, we will deal with the hot deserts. As previously mentioned, about 150 kilometers (95 miles) south-east of Los Angeles we find Palm Springs, a desert city, scorchingly hot in summer. The desert that extends through south-eastern California, southern Nevada and south-western Arizona is called Mojave Desert: this is the most typical type of desert, with sunshine for most of the year, low rainfall, around 100 mm (4 in) per year or less, concentrated in winter and virtually absent in summer. The warmest areas of the desert are the valleys that lie around sea level or even below, such as Death Valley, a depression at 85 meters (280 feet) below sea level; these valleys have a mild winter, with highs around 18/20 °C (64/68 °F) and lows around 3/5 °C (37/41 °F), and a long scorching summer, with average highs around 42/46 °C (108/115 °F). Death Valley is the hottest place in North America, and one of the hottest in the world: here the highest recorded temperature is an incredible 56.7 °C (134 °F)! At higher altitudes, the weather remains hot during summer, but it's more bearable, while winter nights can be cold. In Las Vegas, Nevada, at 650 meters (2,100 ft) above sea level, winter is mild during the day, around 13/15 °C (55/59 °F), but with possible slight frosts at night. Snow is very rare, though in winter the mountains surrounding the city are often covered with snow. Summer is hot, with highs generally around 40 °C (104 °F). Every so often, during summer some thunderstorms may break out, but for the rest the sun always shines: in Las Vegas there are as many as 3,820 hours of sunshine per year, more than in Los Angeles (3,250 hours) and in San Francisco (3,060 hours). Further south, between the south-eastern tip of California and the southwestern part of Arizona, we find the Sonoran Desert. Here the rainfall is slightly higher, between 100 and 250 mm (4 and 10 in) per year, and it experiences a summer maximum due to a bit of moist air coming from the Gulf of California, which creates a kind of "little summer monsoon". This is the area where the saguaro, the giant cactus, is found. Let there be no mistake: the weather is still sunny for most of the year, but we cannot exclude some thunderstorms, sometimes even strong, in summer. Phoenix, Arizona, at 340 meters (1,100 feet) above sea level, is located at the edge of the area. Here winter is mild, with cold nights but spring-like days, around 18/20 °C (64/68 °F), while summer is scorchingly hot, around 40/42 °C (104/108 °F) during the day and 26/27 °C (79/81 °F) at night. Phoenix is famous in the United States for being a very hot city. The sun almost always shines (up to 3,876 hours per year), but in summer, from July to September, every so often a thunderstorm breaks out, and the wind can cause sandstorms. In Tucson, located further south, almost 800 meters (2,600 feet) above sea level, the peak of summer rainfall is even more visible: on average, 55 mm (2.2 in) of rain fall in July, 60 mm (2.4 in) in August and 30 mm (1.2 in) in September. The maximum temperature is highest in June, 38 °C (100 °F) on average, while later it drops slightly, to 37.5 °C (99.5 °F) in July, and to 36.5 °C (97.5 °F) in August, when, however, relative humidity slightly increases. Continuing east, in south-eastern Arizona, in southern New Mexico and in the western part of Texas, we find the Chihuahuan Desert. Of course, the sun shines even here for most of the year, but the higher altitude, on average between 600 and 1,500 meters (2,00 and 5,000 feet) makes the climate cooler: in winter, lows are around freezing (0 °C or 32 °F) or a few degrees below, while highs range between 15 °C and 18 °C (59 and 64 °F), but sometimes during cold waves it can even snow; spring can be windy, and in summer highs hover around 35 °C (95 °F). Here, too, there's a peak of rainfall in summer, between July and September, due to thunderstorm cells coming from the Gulf of California, which can sometimes cause floods. Two cities that are located in this climatic zone are El Paso, Texas, at 1,200 meters (3,900 feet) above sea level on the border with Mexico, and Roswell, New Mexico, at 1,100 meters (3,600 feet). Here are the average temperatures in El Paso. Rainfall in El Paso is scarce, around 250 millimeters (10 inches) per year, but you can notice the summer maximum. Here is the average rainfall. The sun in El Paso shines all year round, however, the sunniest month is June, before the summer rains increase. East of the Pacific coast, two mountain ranges, both parallel to the coast, the Cascade Range in the north and the Sierra Nevada in the south, isolate the interior of the continent from maritime influences. East of these mountain chains we find the huge area of the Rocky Mountains, which cross the central-western United States from north to south. In addition to the highest peaks and ranges, there is a wide area of plateaus and high altitude valleys, where the climate features are quite similar: winter cold and summer heat; remarkable difference in temperature between night and day; low precipitation; limpid air; some summer thunderstorms; sudden increases in temperature due to the Chinook, the warm wind coming down from the mountains, which is able to melt the snow in a short time; intense cold waves in winter, with snowfalls and strong northern winds. Proceeding from north to south, the climate becomes progressively warmer, while there are also some local differences (as regards to precipitation as well) depending on altitude and slope exposure. In general, the southern highlands are the driest, but there are "rain shadow" areas also in the north. In the states of Washington and Oregon, which as we said before are mild and rainy along the coast, the bulk of precipitation coming from the ocean is released on the Cascade Range. To the east of this mountain range, there is an arid plateau, where the climate is continental, with wide temperature range between day and night. Total precipitation is scarce, though is more abundant in winter, with possible heavy snowfalls. Strong waves of frost may occur in winter and also some heat waves in summer; the latter are less frequent than in the center-south. Spokane, Washington, 700 meters (2,300 feet) above sea level, lies in this area, and has an average temperature in January of -1.5 °C (29.5 °F) and in July of 21 °C (70 °F). Precipitation in Spokane amounts to 420 mm (16.5 in) per year, with a minimum in summer. On average, 1 meter and 17 centimeters (46 inches) of snow fall per year, and the snowy period runs from November to early April (of course it takes several centimeters of melted snow to have one cm of rain, and the same applies to inches). Here is the average precipitation. The sun in Spokane rarely shines in winter, while in summer the sky is almost always clear. Further to the east, in Eureka, northern Montana, located at 920 meters (3,020 feet) above sea level, winter is colder: the average in January is -5 °C (23 °F), while in July it's 19.5 °C (67 °F). Precipitation amounts to 375 mm (14.5 in), with a maximum due to afternoon thunderstorms in May and June. In a year, 125 cm (50 in) of snow fall, from late October to April. In the far north-east of California, in Alturas, at 1,300 meters (4,250 feet) above sea level, the average ranges from -1°C (30 °F) in January to 18 °C (64 °F) in July. In summer, the temperature range is truly remarkable: it ranges from 7 °C (44.5 °F) at night to 31 °C (88 °F) during the day! Here the annual precipitation is 308 mm (12 in), with a minimum in summer. On average, 78 cm (30.7 in) of snow fall per year. Further to the north-east, in Boise, Idaho, at 865 meters (2,840 feet) above sea level, the average temperature ranges from -1°C (30 °F) in January to 24 °C (75 °F) in July, so summer begins to be quite hot. Here, only 300 mm (12 in) of rain fall per year, including 53 cm (21 in) of snow in the cold half of the year, with a minimum in summer. East of California, in Nevada, rainfall is very low, so that in general, this state is regarded as desert. But while cities such as Las Vegas have a warm climate, at higher altitudes we find a steppe climate. It's the case of Reno, located at 1,350 meters in the north-west of the state, where the average temperature ranges from 1.5 °C (34.5 °F) in January to 23 °C (73 °F) in July, but with wide temperature range, so that lows in July are around 13 °C (55.5 °F) and highs around 33 °C (91 °F); annual precipitation amounts to only 180 millimeters (7 inches) per year, with a minimum in summer. From November to April it can snow, with a total of 62 cm (24.5 in) of snow per year. 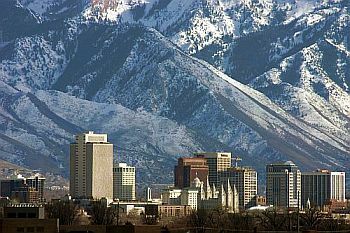 East of Nevada, in Utah, we find Salt Lake City, located at 1,300 meters (4,250 feet) above sea level, near the Great Salt Lake. Here, the average temperature ranges from -1.5 °C (29.5 °F) in January to 26 °C (79 °F) in July; therefore, summer is hot, with some scorching days, and also sunny. Annual precipitation is not so scarce: 410 mm (16 in), with a maximum in spring and a minimum in summer. Between November and April, a lot of snow falls: a meter and a half (60 in) on average. This city is located in a valley, and during winter, in periods of calm weather, pollutants accumulate in the air because of cold air stagnation. 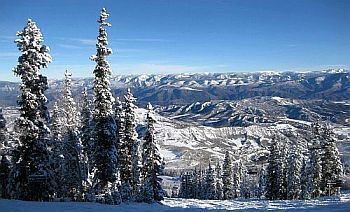 East of the city, there are snowy mountains, where the ski resort of Park City is found. Alta, at an elevation of 2,600 meters (8,500 ft), is the second snowiest place in the United States, with its 13 meters (42.5 feet) of snow per year. Let us now move to the north-east, in the state of Wyoming, where we find Cheyenne, at an altitude of as high as 1,870 meters (6,135 feet), which has an average of -2 °C (28 °F) in January, and of 20.5 °C (69 °F) in July. Here, too, precipitation is around 400 mm (16 in) per annum, with a maximum from May to August (mostly due to afternoon thunderstorms) and a minimum in winter. However, from late October to early May, snow falls (especially in March and April, when precipitation is higher than in winter), totalling 150 cm (60 in) on average. Being that this city lies on the eastern slope of the Rocky Mountains, the Chinook blows frequently, bringing warm and dry conditions. Hence, waves of frost can be intense, but do not last long. The sun frequently shines throughout the year. South of Wyoming, in Colorado, we find Denver, which is located at 1,600 meters (5,250 feet) and has similar characteristics (sunshine, dry air, frequent Chinook, intense but short cold waves, wide temperature range between day and night), but it is a bit milder: the monthly average temperature ranges from -0.5 °C (31 °F) in January to 23 °C (73 °F) in July, when, however, there are cool or mild nights and hot or even scorching days. Even here precipitation is around 360 mm (14 in) per year, with a summer maximum, still because of thunderstorms. Snow falls from October to April, and amounts to about 1 meter and 35 cm (53 in) per year. The sun shines frequently, totalling about 3,100 hours per year. Here is the average precipitation. In Denver, the sun is often seen all year round, and shines for 3,100 hours in total. South of Colorado, we find New Mexico, whose largest city, Albuquerque is located at 1,600 meters (5,250 feet) of altitude. Here we are at the edge of the Chihuahuan Desert, so that rainfall is scarce, 240 mm (9.5 in) per year, with a maximum between July and September due to the influence of the "little summer monsoon", which affects Arizona and New Mexico, and of which we have already spoken. Here is the average precipitation. The monthly average temperature ranges from 2.5 °C (36.5 °F) in January to 26 °C (79 °F) in July. During winter, only 24 cm (9.5 in) of snow fall. Spring is windy, with possible storms of sand and dust, with little rainfall. Here are the average temperatures. The sun in Albuquerque often shines all year round. 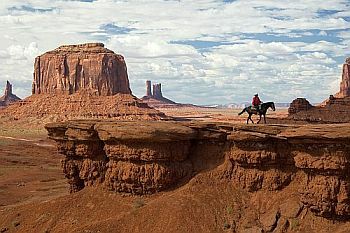 Between Utah and Arizona, we find the Monument Valley, at 1,600 meters (5,250 feet) of altitude. Here winter is cold, with an average in January around freezing. In contrast, summer is warm, with hot days, when the temperatures are around 30/33 °C (86/91 °F), and cool nights. The rainfall is practically at desert levels, in fact it is lower than 200 mm (8 in) per year, but at times thunderstorms can break out, which may take tourists by surprise, creating sudden streams in the valleys. In the Grand Canyon, Arizona, the climate varies with altitude. The south side is located at 2,100 meters (6,900 ft) above sea level, and has a cold and snowy winter (but there may also be periods of good weather, with sunshine during the day and freezing temperatures at night) and a warm summer, when days can be hot, but nights remain cool. Between July and September, some thunderstorms may break out in the afternoon, sometimes intense. The north side is located at an even higher altitude, around 2,400 meters (7,900 ft), so it's even colder, and it's covered by a coniferous forest. But at the bottom, inside the deep gorges where the river Colorado flows, about 700 meters (2,300 feet) above sea level, the climate is very different, and it is similar to that of Las Vegas: desert, and scorchingly hot for many months, with mild winters. 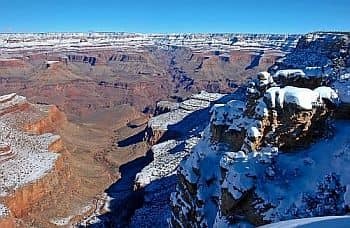 In Arizona, above 2,000 meters (6,500 feet), we find cities such as Flagstaff and Williams, which have a climate similar to the upper part (south side) of the Grand Canyon: the average temperature is around freezing in January and around 20 °C (68 °F) in July; snowfalls may occur, sometimes heavy, in winter, while there's a lot of sunshine for most of the year, and some afternoon thunderstorms in summer. We have already talked about the parts of the mountain areas in which the climate is continental: here we will deal with the areas where the climate is definitely Alpine because of the altitude. As mentioned, in the state of Washington, the mild Pacific currents release moisture as precipitation on the western slopes of the Cascade Range. Mount Rainier is the snowiest place in the United States, with 17 meters (55 feet) of snow per year! At the highest altitudes, above 2,000 meters (6,500 feet), even in Arizona there are forests and ski resorts (such as the Apache National Forest and the Sunrise Park Resort). The Yellowstone National Park, Wyoming, which has an average altitude of 2,400 meters (7,900 ft), is cold for most of the year. The temperature remains below freezing for months, and snowfalls are abundant. The coldest records are spectacular, below -50 °C (-58 °F). In the summer months, the temperature is pleasant during the day, around 20/24 °C (68/75 °F), but it's still cold at night (a few degrees above freezing). Precipitation, about 500 millimeters (20 inches) per year, is well distributed over the seasons, and occurs in the form of snow for several months. Here are the average temperatures. In the Rocky Mountains, we find ski resorts like Vail and Aspen in Colorado, the aforementioned Park City, Utah, or those of the Sierra Nevada in California. As regards to the Sierra Nevada, we can mention the Yosemite National Park, which has different climates depending on altitude. At higher altitudes (the highest peaks are around 4,000 meters or 13,100 feet high) the climate is typically mountainous. At medium-high altitudes, around 2,000 meters (6,500 feet), the climate is that of the aforementioned plateaus (winter is cold and snowy, summer has hot days and cool nights, with some afternoon thunderstorms). At the park entrances, around 1,200/1,500 meters (3,900/4,900 ft) above sea level, the climate is slightly milder: winter is quite cold, with rain and snow sometimes even abundant but also with some mild days, while summer is hot and sunny, though nights remain cool. Here are the average temperatures of Yosemite Village, at an elevation of 1,200 meters (3,900 feet). Precipitation in the park is much more abundant along the western side, and follows the Mediterranean pattern, with a rainy (and snowy) season from mid-October to mid-May, and a dry summer. United States Center and East.